Man, what?! Ok, before you start thinking we’re back in the early 2000’s, this is real life. Apparently, Ja wasn’t too pleased with what 50 Cent had to say about him when his name got brought up on Big Boy’s Neighborhood during a promo stop for Den of Thieves (which is out today). Ja wasn’t done. 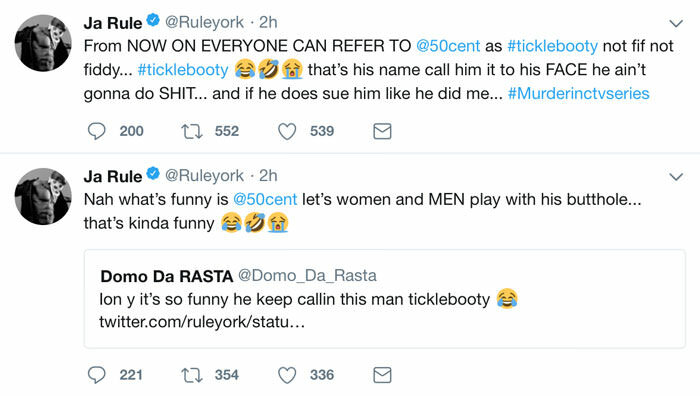 After the initial shot, Rule York continued his rant with a series of Tweets about their past interactions and 50’s sexual preferences. You can’t make this stuff up. And, because Twitter is the best place on Earth when it’s time to make fun of something, we were all blessed with some hilarious reactions from various users across the world. Someone said the Ja Rule and 50 cent beef is old enough to drive 😂😂😂😂😂😂😂😂😂😂 I can't stop laughing!!!!
" I just think its funny how…"
Oh man, what a time to be alive. Let’s revisit a few diss tracks for old times’ sake. Feel free to include your favorite songs and your own reactions in the comments.